After about a month off, the Pro Mazda Championship was back in action in Houston, TX at a street course built in the parking lot of Reliant Stadium. We were coming off a difficult month of May, we had great pace at the Indianapolis Grand Prix and the Night Before the 500 at Lucas Oil Raceway but only came away with one podium due to some bad luck. 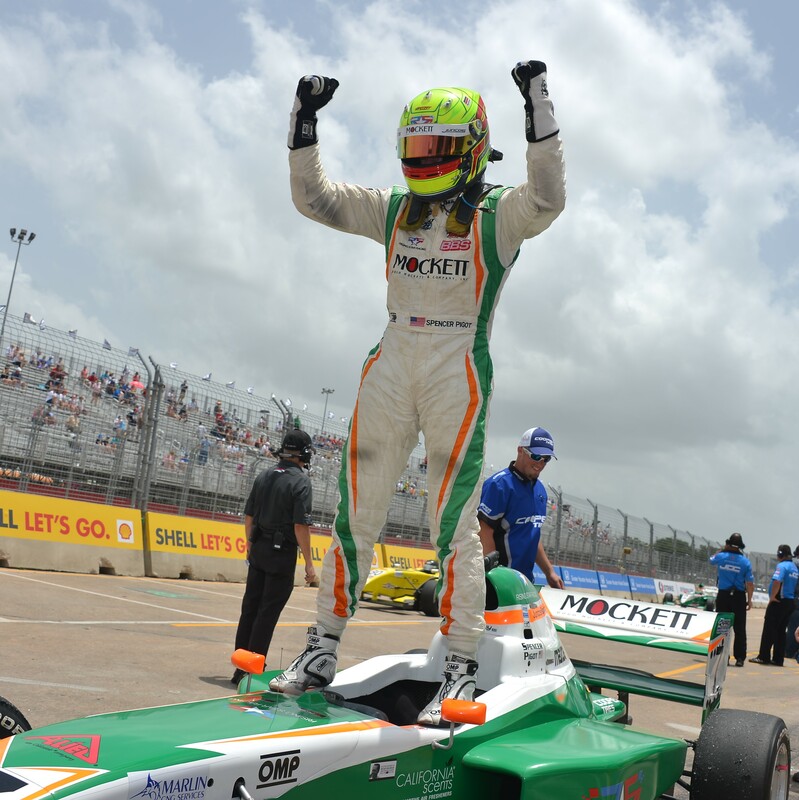 The entire Juncos Racing team was ready to bounce back in Houston. We were one of the first sessions out on Friday morning. The track was very slick for the first half of the session until we laid some rubber down. We had a few issues with the handling during the first session. I came in for a few changes but still wasn’t happy with the car. For the second practice we tried a few more changes. We made some small improvements but not enough to get us to the front. We struggled throughout both practice sessions barely breaking into the top 10. The team and I stayed at the track pretty late on Friday figuring out how we could improve the car and where I could improve my driving. The hard work paid off in qualifying on Saturday morning, I set the second fastest time of the session. Of course we wanted the pole but it was a huge step forward from where we ended on Friday. This weekend in Houston the series changed the starting procedure, rather than the normal rolling starts we did standing starts. I really like standing starts, they’re a lot of fun and I think all open-wheel series should do standing starts on road/street courses. I got a good jump off the line and was right behind Garrett Grist going into the brake zone for turn one. I popped to the outside and passed him going into the chicane. I led the first half of the race. It was all going well until it started to rain. It went full course yellow because of some incidents and the rain continued to get harder. We had some radio problems and I never heard the initial call to come in for wets. I pitted after all the other cars and came out last in line behind the safety car. There was only a few laps of green flag racing left and I was only able to come back to 9th. It was unfortunate because we had worked really hard to be at the front. Sunday we were determined to get a good result. I had lost the points lead on Saturday so I needed to win the race. Again, I had a really good start and got the lead into the first corner. I was hit from behind entering turn three, it damaged my rear wing but luckily it didn’t get completely knocked off. From there I put my head down and led every lap to get the win. I had some pressure from Neil Alberico for the first half of the race. We were trading fastest lap almost every lap. I stretched out the gap towards the end and won by about four seconds. It felt great to win again! We regained the points lead and stretched it out to 17 points. I can’t thank the guys at Juncos Racing enough for all the effort they put in this weekend, from 8th place in practice to having the pace to win both races was a big accomplishment. Our next race event is at Mid-Ohio on August 2nd-3rd. We were fastest there at the series test a few weeks ago so we’re confident of a good weekend when we head back.